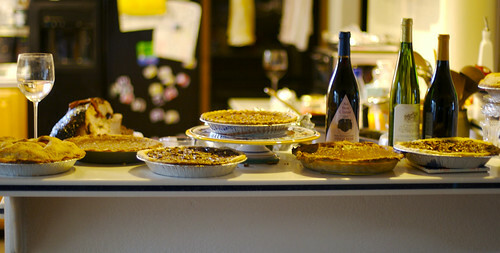 bbum's weblog-o-mat » Blog Archive » A pie-crazy thanksgiving meal! We had an awesome thanksgiving meal over at a friend’s house. Somehow, we ended up with 7 pies for 10 people. I made two butternut squash pies. Ben brought two walnut pumpkin pies and two closed top apple pies. Finally, Chris P. brought a sweet potato pie. And that level of excess was the theme for the rest of the meal. We had green beans with fennel, salad, sweet potatoes with marshmallows on top, cranberries, and probably a couple of other dishes that I can’t remember. And, of course, there was Turkey. Delicious oven roasted perfectly cooked juicy turkey. With stuffing. I also brined and rosemary smoked a 20 pound pork leg. Cooked it to an internal of 145 degrees in about 4.5 hours on the BGE> The end result was just flat out stunning. This entry was posted on Saturday, November 24th, 2007 at 12:08 am	and is filed under Entertainment, Food, Life. You can follow any responses to this entry through the RSS 2.0 feed. You can leave a response, or trackback from your own site. Hmmm…wouldn’t have thought to put fennel with green beans before. I’m intrigued! Could you suss out the recipe? Hey you are making me jealous… and hungry.